As Riker gets enamoured with a new and improved holodeck creation, the Enterprise is hijacked by Bynars. Captain Picard says he expects a glowing report because the ship has performed admirably. Has he been watching the same show I have? The holodeck malfunctioned, nearly causing the death of a crewmember, the computer was infiltrated by an alien force without triggering any alarms, and the transporter failed at least twice to pick up malicious infections. If the two Bynars are One Zero and Zero One, I'm guessing the other two are named Zero Zero and One One. So if there's another Bynar, what do you name it? I like how alien the Bynars act, look, and sound. They remind me a little of the Talosians from "The Cage" and "The Managerie." "A blind man teaching an android how to paint" = awesome. For all you heathens out there who don't know, Riker's playing "The Nearness of You." I think Minuet is self-aware. That's a pretty crazy philosophical can of worms. What's with the male computer voice? Did the Bynars change one of the computer settings? There's nothing quite like an auto-destruct sequence! Microsoft must be run by Bynars. It would explain so much. "Their reason was part of the binary thinking. For them there are only two choices: one or zero, yes or no." That's retarded, Riker. Poor Riker. You meet a girl at a bar and she's everything you could have ever wanted in a woman, so much so that you question whether or not she's even real. She completely rocks your world, but when you see her again later, she's nothing like you remember her. Isn't that always the way? 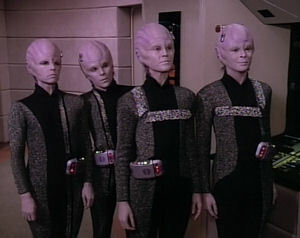 Up to this point, this is probably my favorite TNG episode so far, but I'm at a loss to explain why. Though you see airlocks fairly regularly in DS9 and ENT, you don't see them in TNG very often, do you? "If winning is not important, why keep score?" Worf's starting to come around, finally. I'm so glad the writers don't forget about Minuet. We will see her again in "Future Imperfect."